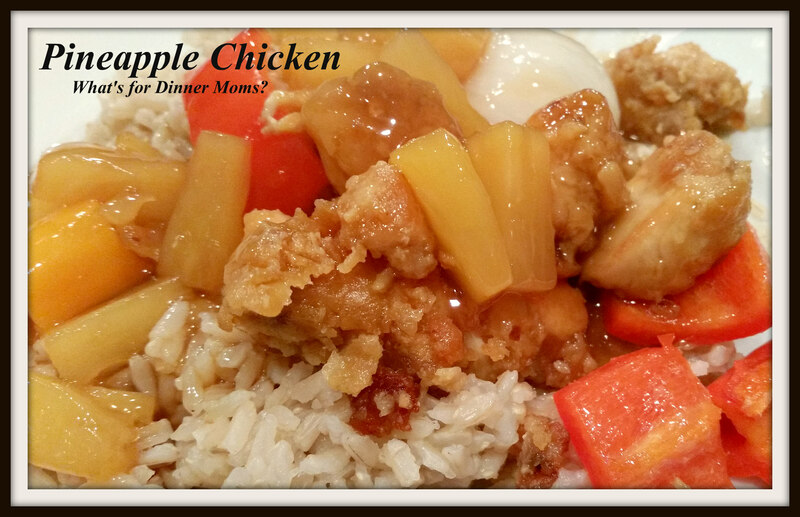 Pineapple Chicken – What's for Dinner Moms? We did a small grocery shop this past weekend for some meat and essentials rather than our usual big monthly shop. We have some expenses coming up this month that we wanted to be sure we had enough in reserves to pay for. But, with boneless, skinless chicken breasts for $1.59 a pound? Couldn’t pass up that sale! So, as we were prepping the meat for the freezer I had a bag of breasts cut into chunks left in the refrigerator. I knew I wanted some type of Asian dish but I had to figure out what I had in the pantry to use so there was no running to the store at the last-minute. Well, I ended up breaking that rule as we got 2/3rds of the way into cooking the dish and I opened the can of cornstarch to find 2 tablespoons instead of the 8 I needed. Oops. We always have a big container on hand so it never even occurred to me that we may not have enough. So, we did a quick run to the grocery store but it was only for cornstarch. I hate when that happens! This was a super hit! It was sweet and sticky and both kids ate it over brown rice. Yes, my daughter ate brown rice! They both asked for this dish again before we had even finished dinner. In our house that only happens for very special dishes. This one was elevated to that status. Mix chicken chunks with sesame oil, soy sauce, eggs and black pepper until chicken is well coated. Cover and refrigerate for 2 hours. When ready to make dinner add flour and cornstarch to the chicken. Stir to make a thick batter. Heat oil in large frying pan on medium high heat. Add chicken and fry until chicken is browned, turning as necessary. Remove chicken from oil onto plate lined with paper towels. Remove all but a tablespoon or so of oil from the fry pan. Add vegetables and stir fry until desired tenderness is reached. While frying the vegetables in a saucepan, combine pineapple and pineapple juice. Bring this to a boil then add the brown sugar and soy sauce. Let the sauce simmer for about 5 minutes. In a small bowl, mix the cornstarch and water until the cornstarch dissolves. Pour the slurry into sauce. Continue to boil and stir constantly until desired consistency is reached or about 3-5 minutes. Return chicken and vegetables to pan to warm. Serve rice, topped with chicken and vegetables with sauce poured over the top. Wow boneless/skinless under $1.60 a pound? Let me at it Marci! We love Pineapple chicken too. Nice! Yes! We were up to $2.29 a pound for awhile but it just dropped. Stocking up with 30 pounds cut and frozen. That’s a great price Marci-I’d be loading up also! When I saw the title, I thought it must be yours. Your recipes are simple, delicious, and not intimidating at all. These are the recipes one can actually make. Thank you! That is exactly what I do. I want to let everyone know it can be easy to make good food and get it on the table without lots of cans, cream of soups and premade doughs. Thank you! Hope you like it as much as we did. Awesome price for chicken! Bummer you had to run to the store just for cornstarch but it sounds like it was worth it. Sounds yummy! Thanks! I was so mad that I had to stop dinner but we were back at it in 12 minutes!